You can accomplish a lot in 10 years, with strategic vision and leadership, enthusiastic support and some very bright law students—and that’s exactly what the David Asper Centre for Constitutional Rights did: 46 constitutional roundtables, 21 student working groups, 20 interventions at the Supreme Court of Canada, 10 conferences and symposia and seven Constitutional Litigators-in-Residence. 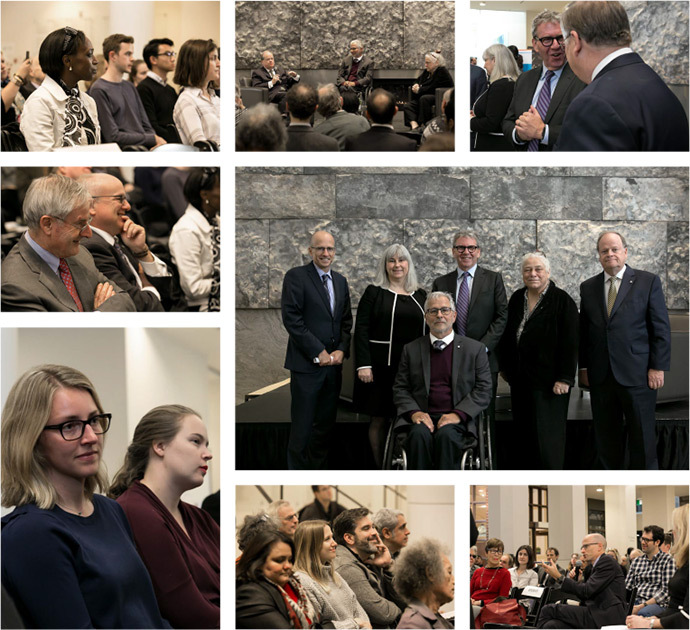 The Asper Centre celebrated 10 years of advocacy, legal research, student clinic work and a litany of achievements, with a special panel discussion with top litigators in the constitutional bar—and a gift of confidence from its benefactor, David Asper, to ensure the centre’s viability for years to come. Asper donated $2.5 million, as part of the Campaign for Excellence without Barriers, to fund the David Asper Bursary and to guarantee the future of the one-of-a-kind Asper Centre, the only constitutional advocacy and research centre with experiential learning for students at a law school. This gift is in addition to the $7.5 million Asper donated in 2007, then the largest individual gift to the Faculty of Law, which kick-started the building campaign and launched the centre. A LLM graduate of the Faculty of Law and a prominent criminal defense lawyer, Asper successfully represented David Milgaard in overturning one of Canada’s most notorious wrongful conviction cases. After the cancellation of the Federal Court challenges program, which occurred during his graduate studies here, Asper stepped up and conceptualized its replacement – and it took only one year to hit the ground running in its advocacy work. Executive Director Cheryl Milne has led the centre since its opening and has grown the program significantly. As part of the anniversary event, a panel discussing Canada’s constitutional top issues was moderated by former Supreme Court Justice Thomas Cromwell, in conversation with two of the country’s top constitutional lawyers, Joseph Arvay and Mary Eberts. Arvay and Eberts, who received Orders of Canada this year, were also among the centre’s prominent participants in the Constitutional Litigators-in-Residence program, where they shared the breadth and depth of their legal expertise and skills with law students in experiential clinics. John Norris, Raj Anand, Janet Minor and Breese Davies were also Constitutional Litigators-in-Residence, and the current resident is Susan Ursel. As Dean Iacobucci and Cheryl Milne said in their opening remarks, the centre has collaborated with prominent political scientists from the University of Toronto and across Canada and has written on the state of Canada’s democracy, the role of unwritten constitutional conventions and how the Canadian government works. It has made submissions to government committees on legal issues ranging from the privacy rights of jurors to various amendments to the criminal code. The centre’s ground-breaking work also includes pioneering clinical legal pedagogy, including incorporating reflective learning and legal project management into constitutional work. WATCH the video of the Asper Centre’s 10 anniversary panel discussion on YouTube.